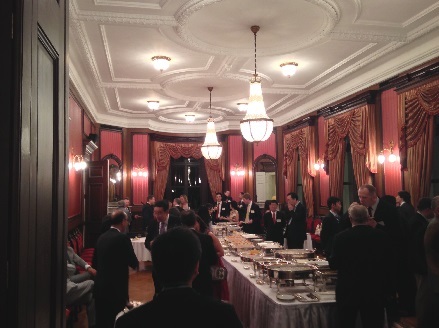 On Thursday July 10th, the Cambridge & Oxford Society and the Harvard Club held a joint party at the beautiful Tsunamachi Mitsui Club in the Mita area of Tokyo. It was Camford’s third time in this handsome building overlooking a large period garden that slopes steeply downhill almost to the boundary wall of Keio University. It was designed by the British architect Josiah Conder as a reception and guest house for the Mitsui family and dates from 1913. If it reminds you of the Akasaka Palace (now the State Guest House), it could well be, for that was designed a few years earlier by Conder’s talented Japanese student Katayama Tokuma and opened in 1909. To give attendees a chance to enjoy the garden while it was still daylight, the Club authorities kindly allowed us in at 6:00 p.m., half an hour before the official starting time of the event. Some attendees stayed and chatted on the lawn near the fountain with its mythological guardians, while others, more adventurous, went down the steep stone paths and explored further. A sudden deluge of rain, however, got us all back into the building at exactly the right time for drinks followed by an excellent and varied buffet, served with the customary style. Not for the first time, the party was enlivened by being a joint event with the Harvard Club, making for a nice change of pace on both sides. It is noticeable that there are differences even in Japanese men or women who have studied in one country rather than the other. Is it worth having these joint events on a more regular basis, perhaps twice a year, with each side taking turns to invite the other to one of its functions? Final note: The season’s 8th typhoon had been making worrying headlines for a day or two, but as typhoons go this one was remarkably kind to us. The rain held off while we were going to the Club and strolling in the garden, and then came down in earnest just as drinks were being served. From a fairly safe standpoint on the terrace, we could sip our drinks and watch spectacular blasts of pouring rain refreshing the green of the garden; and as the evening drew to a close, the rain let up and it was reasonably clear again for the journey home. Posted in Event Reports | Guests welcome Submitted by huw.williams on Wed, 2014-07-09 05:30.